President Marie Louise Coleiro Preca’s last international commitment has taken her to Italy, for meetings with President Sergio Mattarella in Rome as well as with Pope Francis at the Vatican. In keeping with tradition, President Coleiro Preca is concluding her Presidency with a visit to the Pope at the Vatican. According to a Vatican statement, the Pope and the President referred to the good relations btween both sides and to collaboration between Church and State in favour of the human, social, cultural and spiritual progress of the Maltese people. Topics of common interest were also discussed, including migration in the Mediterranean, and inter-religious dialogue. 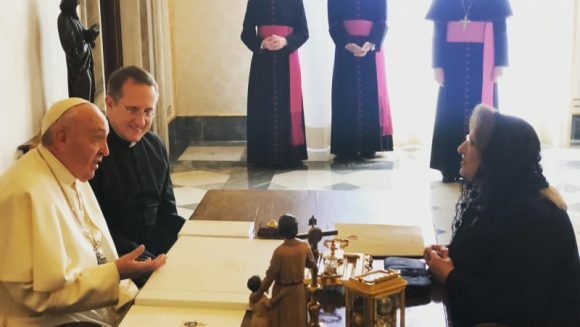 President Coleiro Preca presented the Pope with a copy of the national declaration for harmony between religions, signed in Malta last month. The declaration speaks about common values uniting religions. Together with Foreign Minister Carmelo Abela, the President also met with the Vatican Secretary of State, Cardinal Pietro Parolin, who was accompanied by Monsignor Antoine Camilleri who assists the Cardinal in his work in the Vatican’s relations with other states. Outside the Vatican, President Coleiro Preca met with Italian President Sergio Mattarella. The meeting focused on political and economic relations between the two neighbouring countries. In Rome the President also met with members of the Maltese community. She thanked them for the visibility they afford for Malta in Italy through their work and presence. The President stated that it is good when bilateral relations develop at the level of contact between persons in their daily lives, as in schools, universities, places of work and in the social sector.